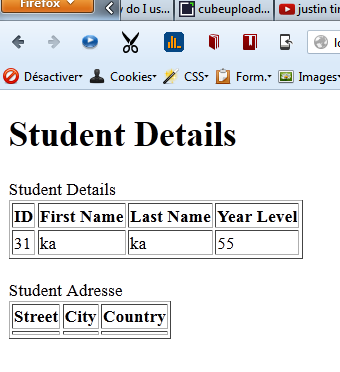 Now I try to display a given student details (its Student + its Address details) in a JSP page but only the Student information are displayed and not its address. here is the problem; the address part is not loaded. So now how can I check first if addresses are being loaded before student object is passed to the jsp? A friend tell me that I can printing the addresses in the servlet but I dont know how to do that. 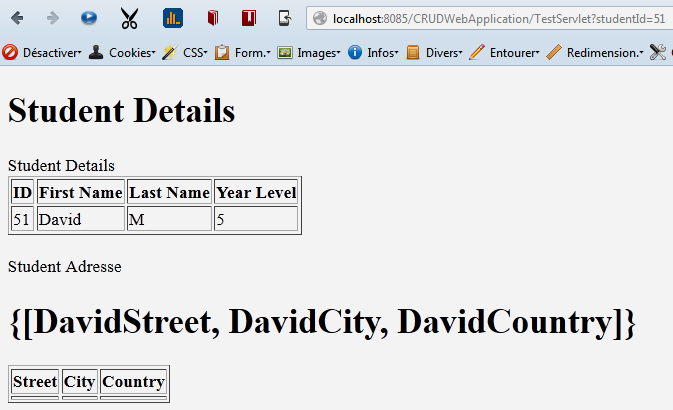 2: - is the Jsp code ok to display the an student's address? Learn about logging now. Right now. Do not pass GO, do not collect $200, until you know how to use logging to help debug your applications. Log4J is a popular choice, or you can use the builtin java.util.logging. I would connect to the database first and check that the student record you are retrieving has addresses linked to it. James Boswell wrote: I would connect to the database first and check that the student record you are retrieving has addresses linked to it. Now, either by logging or running your code in debug, confirm the size of the address list for the student entity straight after you have retrieved it. If the list is empty, I suspect lazy loading may be the issue. In which case, you could try changing your fetch type to EAGER. James Boswell wrote: Now, either by logging or running your code in debug, confirm the size of the address list for the student entity straight after you have retrieved it. but I changed the fetch type to EAGER but nothing. Did you solve this issue Asme? James Boswell wrote: Did you solve this issue Asme? Well not yet unfortunately, am still waiting for someone to help me, you've an solution? Have you added logging to your application? Sitting around and waiting for other people to do your work isn't going to help you progress much. Bear Bibeault wrote: Have you added logging to your application? Bear Bibeault wrote: Sitting around and waiting for other people to do your work isn't going to help you progress much. So what I am supposed to do for you to help me? Logging is a way to display debug output in a controlled fashion. ShowSomeEffort. Finding out if the missing data is really there or not is the first priority. OK, so it looks like the street, city and country are in an array or list? If so, think about that. Is that a good way to represent the data? Your EL expressions try to treat those values as properties -- which is what I would expect. Why isn't the data arranged accordingly? P.S. So it's looking like the issue is poor choices for data modeling. This does not mean that you should not look into learning how to use logging. It is an essential development tool. Bear Bibeault wrote: Your EL expressions try to treat those values as properties -- which is what I would expect. Why isn't the data arranged accordingly? Bear Bibeault wrote: P.S. So it's looking like the issue is poor choices for data modeling. O what you suggest me? Answer this: why are those values in a list? The first name isn't in a list, why would city be in a list? Bear Bibeault wrote: Answer this: why are those values in a list? The first name isn't in a list, why would city be in a list? You can use a one to many, but the list should be of address elements that contain the properties of an address, not the individual elements of one address. Bear Bibeault wrote: You can use a one to many, but the list should be of address elements that contain the properties of an address, not the individual elements of one address. ok So what I must do? You need to figure out if the data is loading correctly. At first glance, it looks like the list should be off addresses, but you need to figure out why the list contains city, state and country instead. You JSP output does not seem to jive with the code -- but I haven't taken a good and close look at it. Bear Bibeault wrote: You need to figure out if the data is loading correctly. At first glance, it looks like the list should be off addresses, but you need to figure out why the list contains city, state and country instead. You JSP output does not seem to jive with the code -- but I haven't taken a good and close look at it. Giving up is not going to get you anywhere when working with software. Can you post your full JSP file please? To be honest I think that you are taking a rather big bite all at once, which is making it seem overwhelming. I'd concentrate on getting the DAO fully created and tested to produce the data in a reasonable format. All this worrying about in the JSP is just a distraction until the data layer is operating as expected. I think the data is being returned correctly (assuming each student has exactly one address). However, I agree, testing this first is a very good idea and should take priority over any problems in the presentation tier. Asme, assuming the data is being returned correctly, I would revisit your for each tags in the JSP as they don't look correct. It would be good to see the entire file though.